Love it, but it’s hands down also the LOUDEST bag on the planet! I’m excited to see it IRL. Angie, thanks for the kind words about our new 100 percent compostable SunChips bags! As far as your concerns for the rest of the Frito-Lay brands, we are introducing this transformational 100% compostable packaging first for SunChips. When manufacturing of this new compostable packaging reaches full scale, we can explore how other Frito-Lay brands – like Doritos – can begin to utilize the new packaging as well. Frito-Lay is committed to minimizing impact on the environment and reducing the resources needed to make our products, so stay tuned! Hey – thanks for writing back. I’m really excited about the new bag. 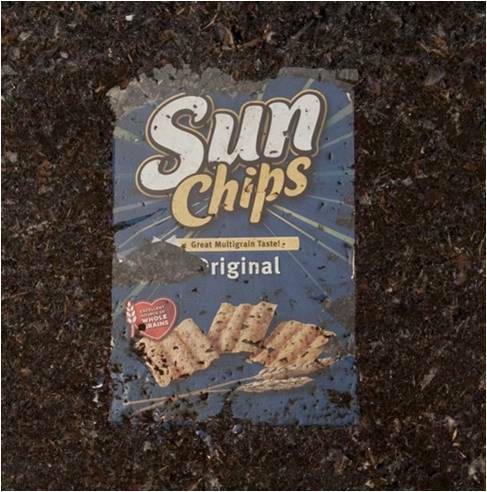 Sunchips are my favorite any way … so it makes them that much better that I can put the bag in my compost bin.